They don't sell mini-trucks in the U.S. any more, and that is a shame. As today's Nice Price or Crack Pipe BMW 3-Series proves, sometimes you just have to take matters into your own hands. Sadly, an overwhelming 63% of you took matters into your own hands yesterday and decided that the price of the '89 Toyota Van was way too high for you to go Space Truckin'. That Van's Van Works conversion enhanced its utility and livability, and while today's contender isn't an official conversion, it's also more utilitarian than before, but could you live with it? This 1990 BMW 3 Series is the Chaz Bono of small Bimmers. 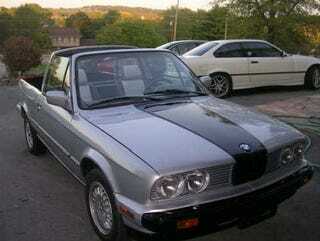 According to the VIN, it was born a 325i convertible with the 169-bhp version of the M20 six. After what were likely several surgeries and some soul searching, it's now a targa-roofed two-seater that has sprouted a pickup bed and a 1.8-litre four in place of its silky six. You win some, you lose some. The bed conversion includes a working tailgate, although its incorporation of the tail lights means you won't be driving it gate-down around the Po-Po. Typically, the ad is short on details, but does divulge that this has been an ongoing project that has fallen by the wayside due to business obligations. Regardless, the pictures indicate a pretty complete car, although there's no mention of whether there's anything to fill the space above the seats should the weather turn inclement. If not, this should be considered a fair weather friend as the remaining interior looks very nice, incorporating a pair of two-tone sport seats and what looks like a crack-free dash. Behind the seats, the bed is separated from the cabin by a bulkhead into which a sliding back window has been installed, although missing is a rack for your FABARMs. As the car is based on the all ready strengthened structure of the droptop, and the fact that there is that mid-car stiffening structure, it's probably unlikely that it would fold itself in half at the first rail road crossing. Probably. With all that has been done to it, it seems like the 124,296 miles under its tires is less than relevant - sort of like asking Caroline Cossey how many girls she poked before getting her equipment reconfigured from plug to receptacle. Despite its reassignment surgery, this 3 Series still has a clutch pedal dangling down under its dash, and a five-speed stick to accompany it. Whether it's still the Getrag 260 that came with the car originally is unknown, however. Also unknown is the reason behind the replacement of the six with a 1.8-litre four. The seller isn't even letting on as to which four it is, whether the M10, M40 or M42. Either way, as this was originally a 325i, and has all the stronger components of that car, it would only make sense to drop a six back under the hood. Dropping a six will only add to the price, and right now eBay's Buy It Now for the car indicates you'd have to drop $7,500 on it before you could start dropping things into either the engine bay or the bed. So what's your take on this BMW with a bed? Would you drop that $7,500 to bed down with it? Or, would paying that price keep you up at night?